Identify and assess MAS spectrum availability, assign frequencies, and prepare documentation to obtain FCC licensing. You can instantly identify and assess MAS spectrum availability, assign frequencies, and prepare documentation to obtain FCC licensing. Quick Look: Simply enter a set of geographic coordinates and the number of available MAS channels are displayed in real time. 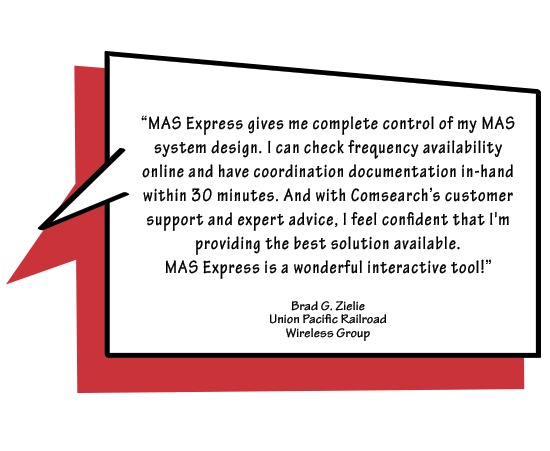 Detailed Analysis: Sorts channels based on operational compatibility with other MAS systems and allows you to assign optimum frequencies for your MAS system. Certification Documents: Provides you with the documents that the FCC requires to obtain your license after the frequencies are selected. Customer Service: You get easy access to advice and tips from our interference and licensing experts.